Beverage industries have two pressing concerns when it comes to bottle molding equipment, one being the constant increase in plastic material costs, so beverage enterprises are always thinking of ways to cut packaging costs to maximize profits, thus advanced bottle molding equipment is required to produce bottles of lighter weight. The second concern is that due to the constant ever-changing market, beverage industries have to adapt flexibly to the shortening lifecycles of beverages. Corresponding to this issue, the industries have to reduce the time for mold replacement to minimum to keep up with the increasingly fast product replacement in PET bottle production. These two pressing issues have posed a significant challenge for bottle molding equipment suppliers. Molding Method: In this method, the molten preform is first injected by the Injection Stretch Blow Molding Machine, after which it is stretch blown in the hollow mold. As the formation of the preform and the stretch blow molding take place in the same machine, it is called the “One-Stage Method”. In addition, as the preform is stretch blown using the remaining heat of the preform before cooling, it is also known as the “Hot Preform Method”. *The processing procedure is as follows: PET raw materials are dehumidified and dried. > The raw materials are melted and injected into the preform mold through the injection nozzle. > The molten PET materials are cooled to 120 degree Celsius in the preform mold. > The hot preform is then placed in the bottle mold to begin the Dual Axis Stretch Blow Molding. Molding Method: In this method, the preform is first injected by the Injection Machine, after which the cooled preform is then heated up in the PET Stretch Blow Molding Machine and stretch blown in the hollow mold. As this method involves two processing steps in the Injection Machine and Stretch Blow Molding Machine, it is known as the “Two-Stage Method”. In addition, as the preform is re-heated and stretch blown after cooling, it is also known as the “Cold Preform Method”. *The processing procedure is as follows: PET raw materials are dehumidified and dried. > The Injection Machine is used to inject the molten materials into the preform mold. > The PET preform formed is allowed to cool down to room temperature. > The preform is processed by a finishing machine before delivered to the Stretch Blow Molding Machine for heating and Dual Axis Stretch Blow Molding. Note: The “Dual Axis Stretch Blow Molding” refers to the use of extendable rod for vertical extensions and high-pressure air for lateral extensions. As the injected preform and blown bottle are in the same machine, the opening of the preform is enclosed in the opening board during temperature adjustment and blow molding, and there will be no contact or collision with foreign objects during the preform transportation, therefore the appearance of the bottle can maintain a glossy, intact, and unblemished surface. It is suitable for the production of elegant, high-priced blow molded containers with varying openings, such as cosmetics containers, and perfumes. If the injection nozzle is replaced, the machine can produce bottles of different materials such as PET, PP, HDPE, PC, and PEN. During the re-heating process, the heating position, range of heating, and heating power can be adjusted in accordance with the different PET preforms and shapes to allow the even stretching of the preform to produce bottles of uniform thickness. It is therefore suitable for the production of high productivity and lightweight bottles, for example, cost-effective and high quality bottles for drinking water bottles and carbonated beverage bottles. The preform can be procured or produced individually. The machine can also be connected to filling machines on the production line. The injection and blow molding can be separated so it would not be affected by the business off-seasons or peak seasons as the machine can continue injecting preforms during the off-season in preparation for the coming peak season. As it is harder to conduct quality inspections on the bottle preform before blow molding, therefore the operators must possess both injection knowledge and blow molding expertise to determine accurately if the defects are caused during the injection or blow molding processes. The method requires more peripheral equipment for both injection and blow molding, is easily affected by the climate, and requires more area for bottle storage. As the injection and blow molding steps are separate, the bottle preform will be stored, transported, and aligned before blow molding, the surface of the preform might have scratched due to collision that would remain visible after blow molding. The large differences between the internal and external temperatures during re-heating will limit the scope of the blow molding, causing difficulties in producing flat bottles, square bottles or bottles with handles. Limited by the finishing machine and blow-molding machine, the bottle can only be blown with a complete surface. It is not suitable for bottles that have specific bottle cap positions. The selection of PET Blow Molding Machines is also a common concern for most clients as the productivity, efficiency, product application, price, energy consumption, machine footprint, and environmental impacts are factors for consideration. 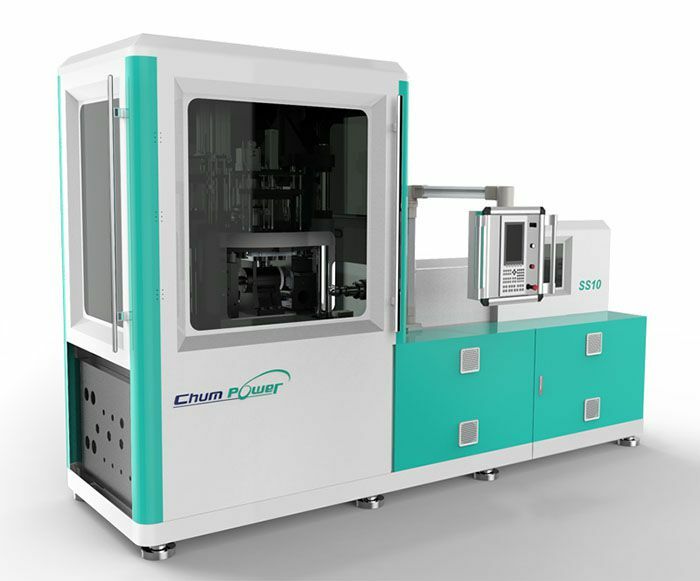 With 20 years of extensive experience in the manufacture of bottle molding machines, CHUMPOWER offers One Stage PET blow molding machine, Two Stage PET blow molding machine, and models with 1-16 cavities that are applicable for bottle products ranging from 10ml to 20L. It is the optimal choice in the bottle molding industry.